A comprehensive guide to over 3,000 contemporary testing instruments and a comprehensive bibliography to all known commercially available tests that are currently in print in the English language. Provides descriptive information (e.g., test purpose, publisher, pricing, population, scores) and edited review(s) written by leading content area experts. The default search mode in MMY-TIP is Basic Search. If you are searching for a specific test, enter the name of the test in the search box. If you are looking for a test to measure a variable, enter keywords for your topic/variable into the search box — for example, < aggression AND children >. Use Advanced Search to access additional search features, such as Test Category or Review Available. Look for the Advanced Search link underneath the main MMY-TIP search box. When looking at the search results, make sure to click on the title of the test to access the full test record which includes both the descriptive information (e.g., test author, purpose, publisher, score, etc.) about the test as well as any available test reviews. If you click on the HTML Full Text link, you will ONLY see the test reviews. 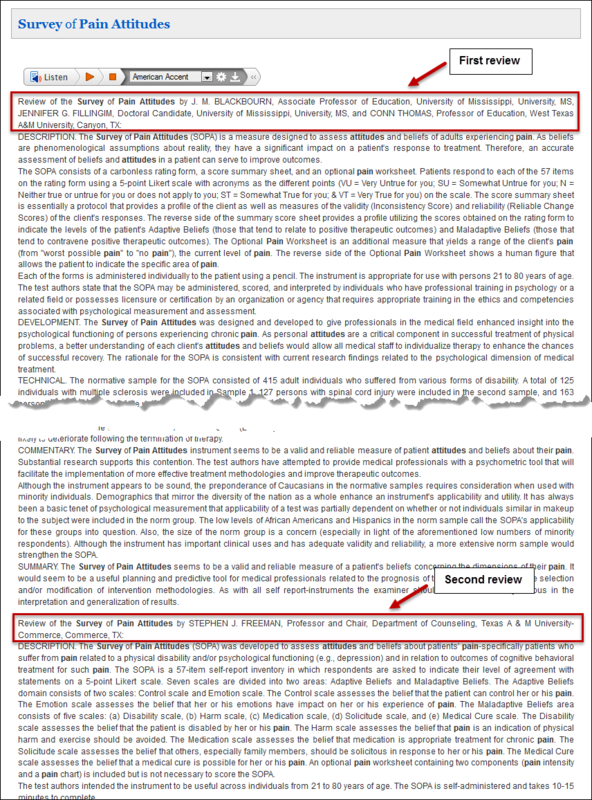 There are often two reviews written by different authors in each test record and it can be difficult to distinguish between them. If there is a second review, it will follow directly after the first reviewer’s “SUMMARY” or “REFERENCE(S)” section without any change in formatting. See the screen capture below for an example. Note: The following information is meant to be a general guide. Double-check with your instructor for any specific citation instructions. Test name as it appears at the beginning of the entry. (Year of MMY edition). In name(s) of MMY editors (Eds. ), The [edition] mental measurements yearbook [electronic version]. Retrieved from the EBSCO Mental Measurements Yearbook with Tests in Print database. Survey of pain attitudes. (2010). In R. A. Spies, J. F. Carlson, & K. F. Geisinger (Eds. ), The eighteenth mental measurements yearbook [electronic version]. Retrieved from the EBSCO Mental Measurements Yearbook with Tests in Print database. Because there are often multiple reviews in each test record, make sure you pay close attention to which review you are reading and who the author of the review is so that your citation (in-text and work cited) will be correct. Last name, first initial of review author. (Year of MMY edition). Review of the [name of the test being reviewed]. In name(s) of MMY editors (Eds. ), The [edition] mental measurements yearbook [electronic version]. Retrieved from the EBSCO Mental Measurements Yearbook with Tests in Print database. Freeman, S.J. (2010). 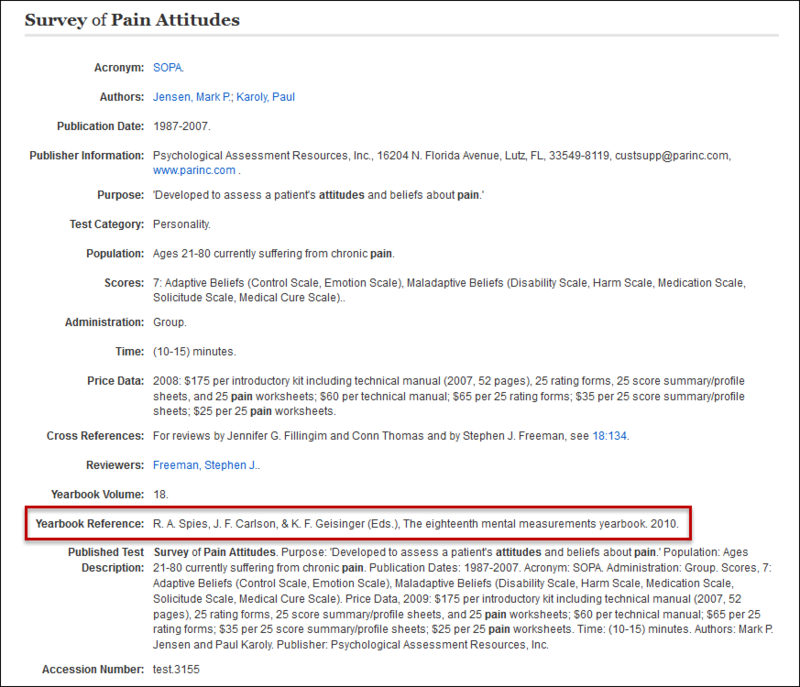 Review of the Survey of pain attitudes. In R. A. Spies, J. F. Carlson, & K. F. Geisinger (Eds. ), The eighteenth mental measurements yearbook [electronic version]. Retrieved from the EBSCO Mental Measurements Yearbook with Tests in Print database. To find publication information for the MMY edition you are citing, look at the Yearbook Reference section of the test record.